Visiting gardens in flaming June is all very well. You know the score……the air is heady with the scent of roses, the borders are brim full with colourful perennials and you walk away completely demoralised, resolving to dig up your own pathetic patch and start again, spade in one hand, credit card in the other. BUT! I like to visit gardens out of season to test how good they really are. And it’s also a great way of learning some valuable lessons from those gardens that do actually pass the test and stand up to your critical Out of Season Scrutiny. 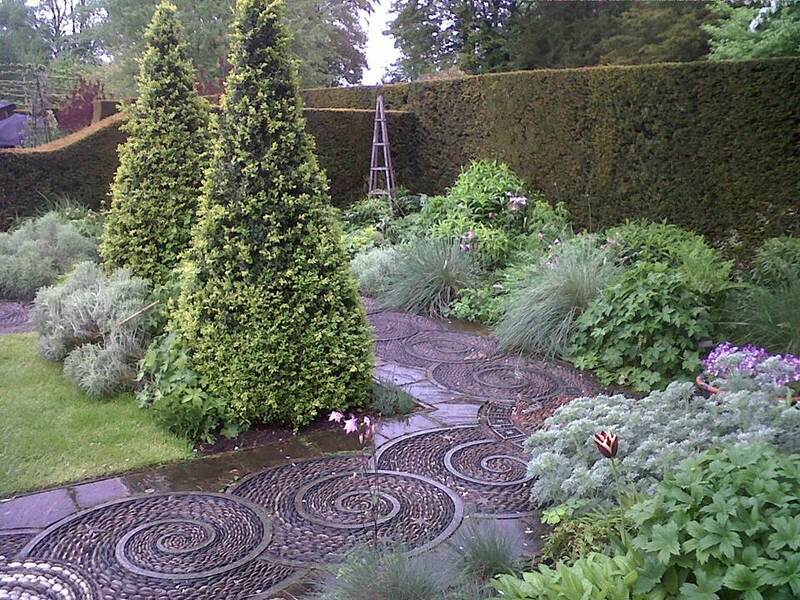 One such great garden is Gresgarth Hall in Caton, Lancashire which belongs to one of our foremost designers Lady Arabella Lennox-Boyd. She’s in her 70s now but still designing after a 40 year glittering career winning 6 Chelsea Gold Medals and the R.H.S Veitch Memorial medal. She first moved there in 1978 with her then MP husband Mark Lennox-Boyd and was utterly dismayed by the damp Lancashire site where the rain never seemed to stop pouring down. But over the years she has used her incredible skill and plantsmanship to transform it into a place of beauty and wonder- apparent even on a wet Out of Season visit, as these photos show. I don’t want reminding of where I came from ( a city slum-long since razed to the ground!) but I could have a mosaic of my pet dog as did Great Dixter garden genius Christopher Lloyd? But then again, perhaps not…..
Lady Arabella has a Hellebore Open Day coming up on 12th March and yours truly might very well find herself there, warmly wrapped up of course, having had a nice tea and cake served up by the local church and clutching a few choice Hellebore seedlings. And possibly having gleaned a few more lessons on how to have a great Out of Season garden?